Faye Walker taught African Dance at Virginia Commonwealth University for thirteen years and has been instrumental in keeping Ezibu Muntu a viable entity. Faye Walker is a teacher and performer of African dance and one of the founding members of the Ezibu Muntu. A Hampton, Virginia native, “Sister Faye” has studied extensively with many African and African-American dancers and musicians who were or are now considered masters of the art form. Mrs. Walker has served Ezibu Muntu in many capacities throughout the years: performer, Dance Captain, General Manager, Board Member, Director of the Visual Musicians Color Guard Corps (Footnotes), and Artistic Director. She continues to mentor, choreograph, sit on the Board and co-direct the company. 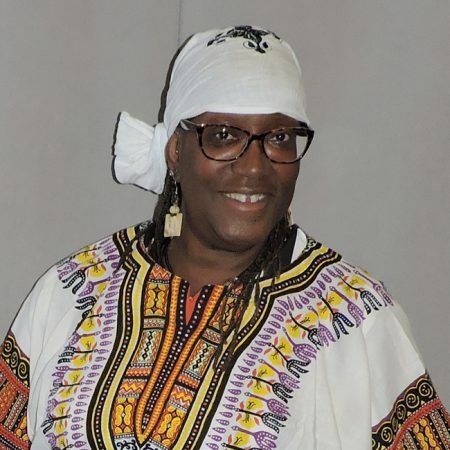 Sister Faye has also choreographed for other companies and theatrical groups including: the University of Richmond’s Ngoma African and Modern Dance Company, the Kuumba Dancers and various community and recreation centers. She has also choreographed and staged musicals for the Hampton University Players. A short list includes: “Dream Girls,” “Ain’t Misbehaving,” “Little Shop of Horrors” and Scott Joplin’s opera, “Treemonisha.” Sister Faye happily worked at John H. Smith High School for 32 years, working with the Hanover Juvenile Correctional Center. She currently works at the Reception and Diagnostic Center at the W. Hamilton Crockford Annex High.